Thought to be the earliest gladiator, the samnite was based on that of the defeated warriors of samnium, who were bested by Rome around 4th century BC. The Romans saw fit to mock the defeated samnites by having them depicted in the Colosseum, but in that battle there was always a chance the samnite might win. One of the most popular gladiators to grace the Colosseum, the samnite was the every man of the Roman games. Armed with typical weaponry that all could relate too, the samnite was someone that many could relate too. Once the relations between Rome and samnium sweetened again it was seem right to not have the samnite gladiator anymore. 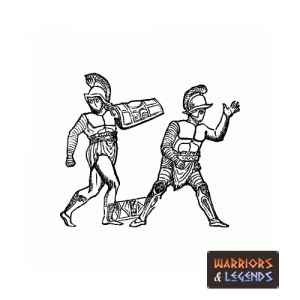 However losing one of the more popular gladiators could prove to be a costly move, so the samnite was replaced with not one, but two very similar gladiator classes the hoplomachus and secutor. Even though they are essentially now retired, the samnite gladiator legacy will live on through many of the depictions and stories focused around these legends of the Colosseum. A samnite gladiators lands a flying strike onto his opponents shield. Like numerous gladiators in Roman times, the samnite gladiator was armed with a short sword known as a gladius. The gladius was standard Roman army issue and therefore many warriors were skilled at using it. The samnite gladiator was actually styled on a person from the region of Samnium in southern Italy, which was overrun by Rome around the 4th century. So when the samnite gladiator fought they armed it with the most similar weapons that these people would have used at the time. The focal point of a samnite gladiator was its very large rectangular shield, which was inherently similar to the Roman soldier shield known as a scutum shield. The curved shape of the shield famous for its ability to allow multiple legionaries to form a tight barrier against projectiles, which of no use to the gladiator, the shape still afforded the samnite good protection. Their shield would be constructed from 3 sheets of wood in a ply format and glued together, the shield be topped off with a leather or canvas coating and a tall metal boss that would run the height of the shield. Large enough to cover a big portion of the samnites body, the shield was their primary line of defence from any attack, but it wasn’t their only protection. They also had a large helmet, with a rim above the eye and a central crest with a large plume. The helmet was not only good protection, but also intimidating with its large plumage and small eye holes. The samnite also sported a manica, an arm guard on their weapon arm, and a greave, a piece of leg armour that went from ankle to just below the knee. All in all, the samnite was fairly heavily armoured, with a balanced set of protection and their large shield with its ability to protect from all angles. The samnite gladiator was replaced by the secutor and the hoplachamus, so we can presume they fought similar opponents, in the murmillo, the thraex and the retiarius. With a large shield for defence the samnite would rely heavily on this to protect them from their enemies attacks. With the only other protection their helmet we can expect the samnite was good at attacking when necessary and shielding themselves when necessary. An illustration of a samnite gladiator. Due to the samnites only weapon being the gladius, similar to many other gladiator classes, they would have had to be very good at counter attacks and thrusting attacks. With the range of the gladius very short, its likely the samnite was manoeuvrable and agile when it came to making a strike count. ‘Appius knew his time was coming to an end, his gladiator class the samnite was due to be retired soon. Rome and the samnites had now found some harmony and for this appius was glad. If he could survive this last battle he might earn his freedom win or lose. With this in mind Appius had a plan and was determined to stick to it, with a brave but carefully measured performance he believe he come out of this battle unhurt. The samnite was one of the most popular gladiators when in action, however over time as the relations between the samnites and the Romans was made good again, it was bad taste to let this gladiator continue. Eventually the Romans replaced the samnite gladiator with the very similar but newly created secutor and hoplamachus gladiators.